On reality tv cooking competitions, producers often can’t resist the urge to structure a challenge around making traditionally maligned foods palatable for kids. Bring on the brussels sprouts! Every time they hand a bushel of these little green balls of goodness to a reticent cheftestant, I get a touch worked up. What did these verdant orbs ever do to anyone to deserve such ire? If anything, they are the victims—subject to generations of sub-par cooking that saps their flavor and squanders their mildly funky twang. Not only are brussels sprouts delicious when prepared properly, they’re crazy good for you. They contain high levels of vitamin C, vitamin A, folic acid and dietary fiber. They also contain sinigrin, an organic compound some believe may help prevent colon cancer. Unfortunately, it’s the sinigrin that can gain a mildly sulfuric odor when overcooked—the main culprit behind the nationwide brussels sprouts backlash. It does seem that these underdog eats are making a comeback. Brussels sprouts have been popping up on menus all over the country, and the city of Philadelphia. Iron Chef Michael Symon is deep-frying ’em at Lola in Cleveland, and gastropubs near and far are sautéing them with bacon—a B.S. BFF—and serving them up as a side. (Try them at the Sidecar in the Graduate Hospital neighborhood). Roasted whole with olive oil, salt and pepper. Clean and trim the sprouts, season them and toss them in a 400-degree oven for 35-40 minutes (or until they are fork-tender inside and crispy on the outside). Don’t be afraid to sprinkle some fresh lemon on the finished product. Sautéed with garlic, white wine and lemon. 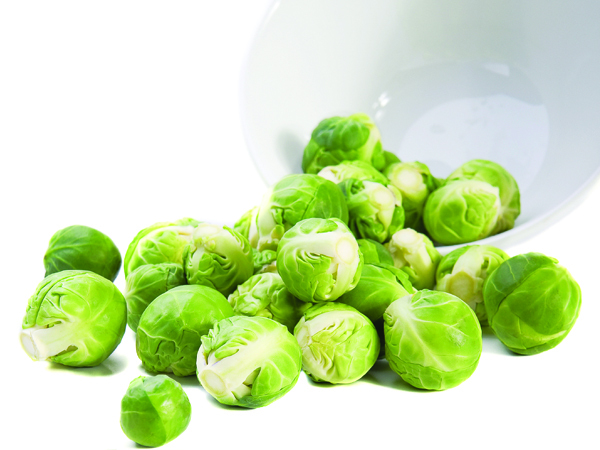 Clean and trim the sprouts, slice them into ¼ inch strips, then sauté in olive oil with garlic, salt and pepper. When the cooking is almost complete (about five minutes) and some of the slices start to crisp, finish with lemon zest, lemon juice and a splash of white wine. Roasted with root vegetables. This savory side dish is perfect cold-weather comfort food. Serve it with a fried egg and grilled bread for a simple supper. In a 425-degree oven, roast coarsely chopped potatoes, carrots, sweet potatoes, onions and brussels sprouts (halved). Before cooking, toss with salt, pepper, olive oil, a splash of balsamic vinegar and any fresh herbs you like. I throw in whole, peeled cloves of garlic (they end up amazingly sweet and creamy). Cook for about an hour, or until everything is cooked through and browned.